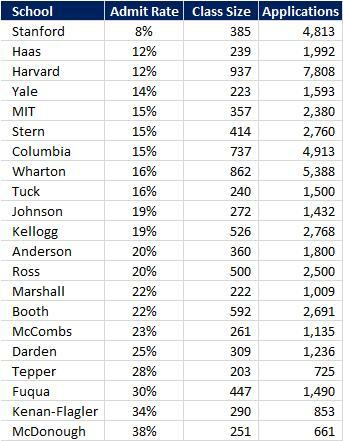 One of the most difficult data points to find is the actual admission rates for all of the top schools. Most of the school rankings have incomplete data; not all schools report their rates during the ranking process. Additionally, when you cross reference the numbers between different sources, they rarely match one another. Furthermore, the way each a school defines it’s admissions rate can be different each time. Did they include the part time and executive applicants as well? Is this for the admissions year or the calendar year? Usually these specifics are left out. Anyway, I wanted to get a broad picture of what the admissions were, so I decided to compile a set of numbers from a single source that had stats for all the top schools. I’ll ignore the potential data integrity issues for now and just use that as my baseline. Finally, the last view I created is a graph of sorted by overall demand. I was a little surprised to see some of the low numbers at the bottom of the graph. McDonough (Georgetown) has one of the lowest levels of demand and one of the highest admissions rates. Kenan-Flagler and Tepper are similar. 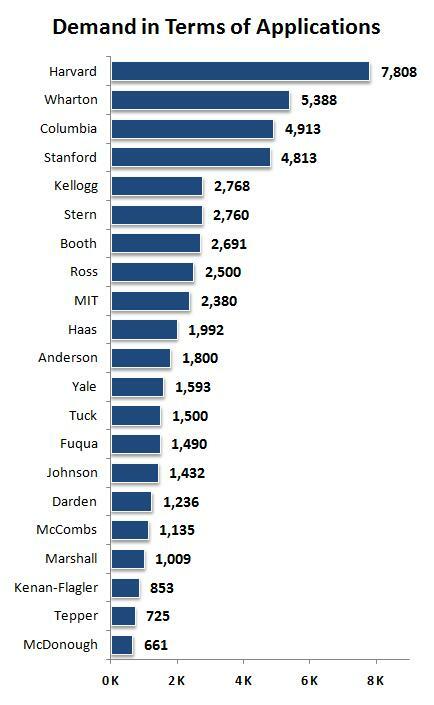 I also didn’t know that Columbia had more apps than Stanford. What are my chances? If I take the weighted average admission rates of Harvard, Wharton, Stanford, Haas, UCLA, and Ross, the percentage is 13.5%. Previous: Do Tech Managers Need MBAs?